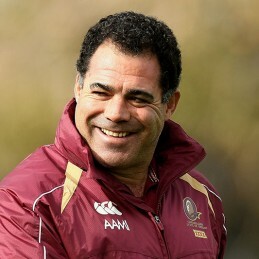 Mal Meninga is a champion of Rugby League who now serves as the coach of the Kangaroos. Mal’s coaching and business skills have made him an in-demand corporate speaker who has plenty of stories to tell. For 15 years, Mal was known for his power, pace, handling and incredible goal-kicking prowess. He is remembered as one of the best players of the modern era. His accomplishments include four Kangaroos tours, including two as captain, a record 45 Test matches, 38 State of Origin matches for Queensland and five NRL premierships. He has also scored more points for the Kangaroos and for the Queensland Maroons than any other player. Mal’s first grade debut came at just 18 years of age with Souths Magpies. He played for the state in 1979 and helped Queensland to its first State of Origin win over New South Wales, converting on all seven goal attempts. After two premierships with Souths Magpies, Mal had a brief stint as a Saint in 1984/85 before heading south to play for the Canberra Raiders. He led the Raiders to their inaugural 1989 premiership over the heavily favoured Balmain Tigers. In 1990 Mal was the league’s top try-scorer and the Rugby League Week Player of the Year on the way to back to back premierships. Mal’s 1994 premiership win over the Cantebury Bulldogs was his last club appearance, scoring the fairytale final try of the match. He repeated shortly after by scoring the final try in Australia’s 74-0 win over France in his final match. Following retirement, Mal took a mentor position with the Canberra Raiders before accepting the role of coach of the Queensland Maroons. Under his tutelage the team has one each of the four series, the only time either side has won four consecutively. Mal was born in Bundaberg, Queensland, and is an Australian South Sea Islander. He is the descendant of workers that were forced into the Queensland sugar industry and is an official spokesman for the South Sea Islander people. Mal has been named in Australia’s Rugby League Team of the Century, had a grandstand at Bruce Stadium named after him, and been awarded the Order of Australia.